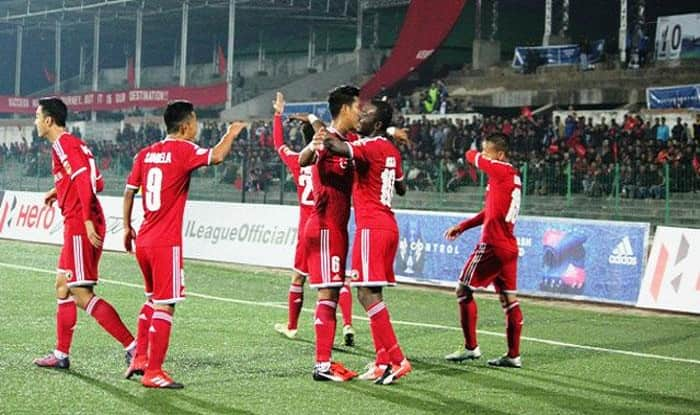 Super-sub Naorem Mahesh Singh struck late in the match as Shillong Lajong FC stunned defending champions Minerva Punjab FC 1-0 for only their second win of the ongoing I League season, Friday. Shillong Lajong players are celebrating after winning the match. Mahesh Singh scored in the 84th minute even as Lajong goalkeeper Phurba Tempa Lachenpa was adjudged the Hero of the Match. Shillong Lajong, placed at the bottom of the points table. The result means that it is the eighth consecutive game for the defending champions where they haven’t been able to secure a win. The hosts, who made some interesting moves through both sides of the flank, couldn’t really find success partly due to lack of a good finish, and partly due to the observant and strong defense line of Lajong. Minerva, however, managed to break into the opposition box a few times, but couldn’t really make the most of all the opportunities that they were presented with. On the other hand, while Shillong made a limited number of moves but their attacks were more organised. However, their problems were similar to Minerva lack of a good finish. Shillong, however, got very close to taking the lead when an attempt from Khongsit from inside the box into the Minerva goal was beautifully defended by the hosts in the 31st minute. This was the closest chance that came by for the visitors who otherwise couldn’t really create any clear chance to score. The first half came to an end with both sides unable to break the deadlock. The second half began with defending champions pressing hard from the first minute, but credit to Lajong’s goalkeeper Lachenpa and their defense for not providing any clear opportunity to the hosts. In the 56th minute, Shillong brought in Naorem Mahesh Singh, replacing Samuel Lalmuanpuia and that brought around a sea change to the visitors’ attacking style. Mahesh in combination with Khongsit made continuous attempts, finding ways into the Minerva box, but their lack of a good finish barred them from taking the lead. Shillong really came close to score again in the 75th minute when Kitboklang Pale made a brilliant run from the center line to play a beautiful pass to Khongsit inside the Minerva box, but to Shillong’s disappointment, the latter could not contain his shot, which went wide, denying the young visitors another clear chance to score. Minerva, who were attacking at short intervals, seemed scattered as most of their attempts were nulled by Shillong defenders. Shillong’s attacking game, which was already troubling the Minerva defense, finally yielded results in the 84th minute when an attentive Mahesh Singh found the back of the net, scoring on a rebound from Minerva goalkeeper Nidhin Lal. The rebound was a result of a shot from Sheen that Nidhin saved but failed to collect safely. Shillong attempted to double their lead in the 88th minute but Pale’s attempt was beautifully saved by Nidhin Lal.